Philadelphia Union face NYC FC tonight in the first match of the 2018 MLS Playoffs. Read our match preview here. PSP will be hosting a watch party at The 700 in Northern Liberties. Feel free to come by to watch the game with everyone. Jim Curtin confirmed Cory Burke will start the match after being benched at halftime on Sunday. The Union would likely not have made it to this point without him. Here’s how they found Burke and helped him become the striker he is. 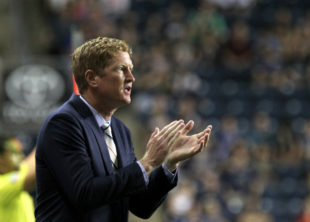 Don’t expect to see the same tactics from Jim Curtin tonight as you did on Sunday. Bethlehem Steel F.C.’s season in photos. Philly Lone Star F.C. signed a two year contract with Cypher Language Services to sponsor their first team kits. Are the Union starting a trend? Houston Dynamo signed 17-year-old Homegrown center back Erik McCue for the 2019 season. After plenty of transfer rumors, Christian Pulisic is focused on Dortmund for the time being. Josh Sargent is reportedly moving closer to becoming a starter for Werder Bremen. After the death of Leicester Chairman Vichai Srivaddhanaprabha was confirmed, Leicester City decided to play their match against Cardiff. A moment of silence was observed. Roberto Martinez is rumored to be the next manager for Real Madrid. This comment is for Harland- who threw poo in a cage late yesterday himself—regarding ‘all the Brainiacs’ here and elsewhere. Hey Harland. Lighten up. Its a blog spot where people come to voice an opinion about a sport in an almost universally acceptable and respectful manner….that’s all. Its a medium for our voices. What happened in New York regarding Donovan McNabb was not respectful… so you are comparing a quince to a star fruit. …so lets keep our eye on the playoff ball at the moment — or in the case of the six union defenders (anyone noticing a trend in my posts lately) standing flatfooted on Villa’s second goal Sunday, lets keep our eye on the lethal striker instead and remember its a blog spot… a platform, a conduit to opinion making in a country with a free press that allows us to do it. Eager for part 2 of the story, where it’s revealed part 1 was nothing more than a hustle to lull NYC into a false sense of security for tonight. That’s the plot, right? Right? just want to comment ahead of the match tonight. i’m not expecting a win and with that, the season is over. my revised goals for a successful season were win open cup and get a home playoff game. they’ll have done neither. i’m not saying we didn’t improve. if anything, the foundation is there. what i am saying is it’s not enough. we find a new coach, we get a few more piece and we look to next season. if they prove me wrong with a win i’ll be ecstatic. were it not halloween i’d be there at the 700.